The two most commonly used blogging platforms are Blogger and WordPress. Many bloggers with hosted domains like mine also prefer to use one of these as their interface. The free WordPress account does not allow you to touch the template. 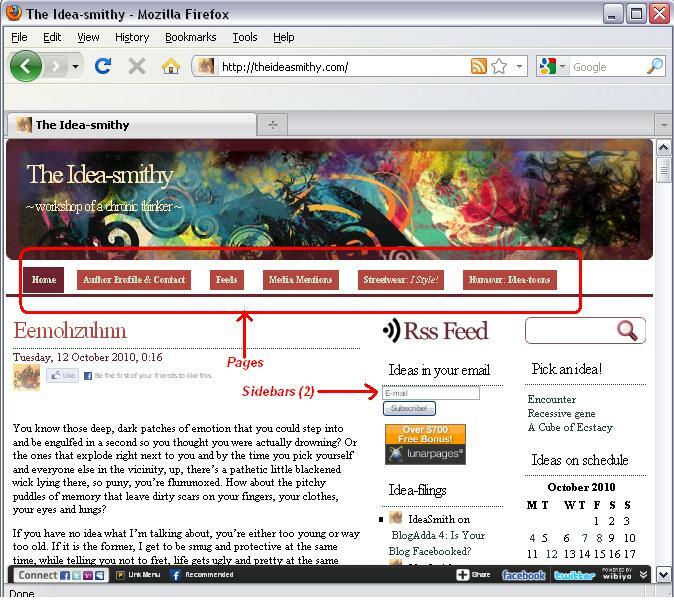 But it is widget-friendly which means that arranging around items on your sidebars is an easy matter of drag-and-drop. It also includes text boxes in the widgets which allow you to incorporate most of the free blog goodies available online (except ad banners). Blogger allows users, access to its code. This does mean that you can tinker around with the template but I advise caution. If you are not highly tech-savvy, proceed carefully, since editing a single line of the code could mess up your blog. When editing or even adding to a Blogger blog, do make sure to back up the code. I usually copy the entire program into a text document and save it. That way, if something I add or edit messes up the blog, I can easily retrieve the original code from my text document. I recommend doing the same thing for a hosted domain where you have access to the code. WordPress gives you a wide variety of templates and the library is frequently updated with more options. Blogger has fewer options but since the code is accessible, these can be changed in numerous ways. If you’re feeling adventurous or if you have a tech-savvy friend, you can even junk the default options and import a new free template. The thumb rule for templates is to use a light background. Most personal blogs prefer dark backgrounds, possibly because it’s available and so different from what we usually tend to see in print (dark font on light background). But the fact is that these standards exist for a reason. Light backgrounds make for easier reading. Similarly so with standard fonts like Arial and Times New Roman. Fancy fonts may be good for a greeting card but your readers are not going to want to squint and ponder a hieroglyphic to figure out what you’ve written. Sidebars are another standard feature of blogs. You may come across a rare blog that uses only pages (a WordPress feature) or a bottom bar. I have no issues with either and in fact, I’d encourage you to incorporate both if the features are available to your blog. However, a sidebar is practically the right-hand (or left-hand if you are oriented that way) of a blog. Visually speaking, it is a norm for blog readers to look to the left or right for blog information outside a post. Making them scroll all the way to the bottom or asking them to click through to another page is pushing your luck. Some templates have multiple sidebar options. Personally, I like having two sidebars. But this really depends on how you want your content to look. Each sidebar takes away from the horizontal space available to your blog post. It means your reader will have to scroll down more to read your post. Also, if you post pictures or videos, you’ll have to make sure they are appropriately smaller sized. On the other hand, having two sidebars means that everything you want to put on the main page doesn’t have to be in one stack. Assume that not all your readers will scroll all the way to the bottom. In this case, you have the tops of two sidebars to use for your most critical sidebar entries. It’s a critical toss-up and you should try out different options before you figure out the best one for your blog. 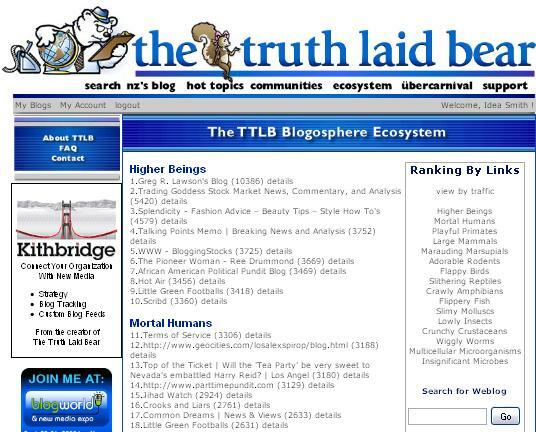 The Truth Laid Bear is an online ecosystem populated by strange characters like ‘Flippery Fish’, ‘Marauding Marsupials’ and ‘Crunchy Crustaceans’. Once you register your blog in this ecosystem, it is given an identity based on its hits. As the blog’s popularity increases, you rise in the ecosystem till you finally attain nirvana as a ‘Higher Being’. The site also gives you a little box that shows readers your current state in the ecosystem. 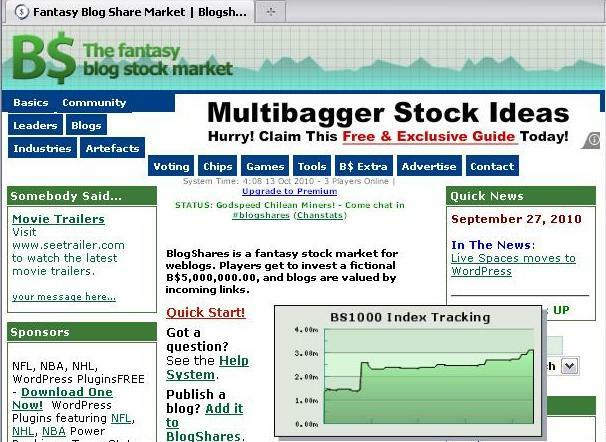 Blogshares lets you trade your blog like an offering in the stock market. Your readers and friends can vie to buy stocks of your blog. Your index is based on the number of sites linking to your blog. You can invest in other blogs, track your blog’s worth and also show it in an impressive looking graph, in your sidebar. A fun goodie for the bears & bulls among you. Blogrolling was my favorite blog goodie back in my Blogger days and it still is a great addition to a blog. In Blogger, you need to code in every entry on your blogroll and format it. Blogrolling lets you divide your blogroll into multiple lists, format them easily and also add features like a flashing indicator against recently updated blogs. Widgetbox is a smorgasbord of blog goodies. My favorite ones are Maukie-the virtual cat (which swipes at your cursor, miaows and occasionally growls), Quotes4all and SATC Quote of the day. There are also widgets that let you run mini-puzzles, install a chat window and track things like weather, lunar phases and world time. If you’ve read my earlier posts, you already know about blog goodies from both Twitter and Facebook. Have fun dressing up your blog and I’ll see you around on the blogosphere! WordPress and Blogger are great, but I wish more people would discover Tumblr. It is easily the most exciting blogging platform on the web. Good series here. However just a clarification. Blogger now has a blogroll gadget. And Blogrolling will be closing on 1st November. Also with ‘Blogger in Draft’ you can have pages in blogger – as I do. @Sharanya: Thanks for that tip. I’m looking into it for a future article. @roshan, Corinne: Thank you! I couldn’t see it on my dashboard yet but it’s great to know that Blogspot users will have access to this feature too! Like I said, you have to switch to ‘Blogger-in-Draft’ to enjoy this feature.